One of the most unique backdrops for a hit of golf, World Heritage Lord Howe Island is renowned for its incredible natural beauty, hospitality and community. Treat yourself to an unforgettable week in Paradise. 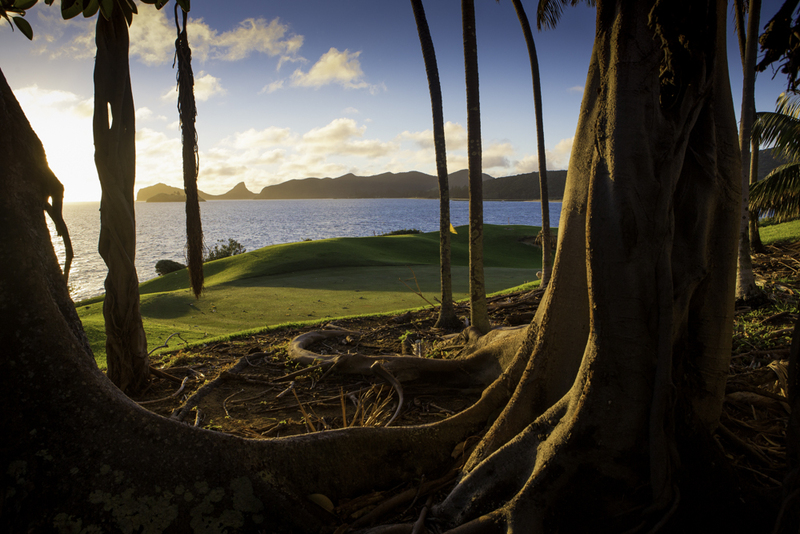 Lord Howe Island Golf Open week is held with over $8000 in prizes to be won. An entry fee of $400 includes welcome drinks, player’s pack, all green fees, buffet lunches on playing days and the concluding presentation dinner. Players of all standards and handicaps are welcome, however only a limited number of entries are available. Players must have a current GA handicap through the GOLFLINK system or overseas equivalent. Travel as a team of 4 and enter our teams event. Your Team's Sunday Ambrose will be combined with the best individual score of each player, over the 1st 3 days, and combined together to give you your team's score! Wild Oats Shootout! Get a nearest the pin on the Ambrose or 1st 3 rounds and you are entered into a final Nearest the Pin Shootout to win a great prize! A full-time greenkeeper, employed by the club, maintains the course in an impressive condition year round. From the shadows of the imposing Mt. Lidgbird and Mt. 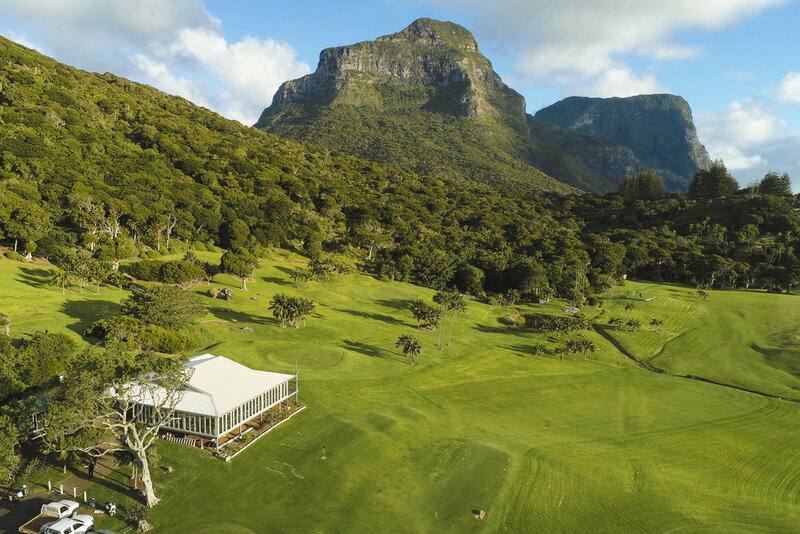 Gower the course meanders through the lushly vegetated Kentia Palm forest out into the gently undulating open fairways along the ocean foreshore providing the golfer with many challenges along the way. An average round of 3 hours (18 holes) allows ample time to pursue the many other attractions on the Island. A fishing trip, a round island cruise, snorkelling, bush walking, scuba diving or coral viewing are some of the active pursuits. A lazy afternoon at the beach or a visit to the new museum may appeal. New Glub House with 270degree views of mountains and the ocean for all the enjoy! Club membership is available to everyone. Social membership $20 for non-playing affiliation. Download the Membership form, complete and return. Of course, visitors are welcome to play anytime and have the option of paying for each game or the weekly fee of $95 for unlimited golf, green fees and club hire inclusive. Lord Howe Island — widely regarded as the most beautiful island in the Pacific — is the closest island getaway to Sydney. It’s less than two hours flying from either Sydney or Brisbane off Australia's east coast. Ideal spot for a wedding reception with one of the best outlooks on the Island! Available Monday, Wed or Sat Nights (other nights may also be available) with undercover seating for 100+ with a beautiful setting all within walking distance to Lovers Bay and Cobby’s Corner - two of the Islands most popular ceremony venues. Please contact the Club directly for further information. Beautiful backdrop from the Club House Verandah!